Brita Åkerman was active in different women’s organizations and was among the directors of Active Housekeeping, an information bureau within the State Information Board, and later even of the Swedish Consumers Agency. Her political work is yet another example of what was seen as typically Swedish, which, at the same time, was infilluenced by the developments outside Sweden. Brita Åkerman (1906-2006) was an industrious person always on the move. Early on she became part of a group focusing on housing and consumer issues-something she was hardly predestined for by her background. Åkerman grew up on a country estate in the province of Södermanland. She chose to focus on languages and literature, and her licentiate thesis from 1933 describes the development of the journalist and author OP Sturzen-Becker (known by the pseudonym Orvar Odd). After this, she did supply teaching, wrote literature reviews and causeries, and gave lectures. However, her participation in the first sociology courses at Stockholm University College spawned ideas of a housing survey. This idea was viewed sympathetically by the Stockholm Women’s Associations’ research group ‘the Home Committee’, of which she was president from 1935 to 1937. With that, a long career as a housing investigator was begun. As president of the Women’s Student Association at Stockholm University College, Åkerman held what she described as ‘an energetic lecture on women’s issues’ at a debate at the Fredrika Bremer Association. As a result of this, she was employed at the association’s office between 1937 and 1939. Her tasks included managing study activities, investigations, and involvement in the publication Hertha, which had already published her article ‘Om kvinnlig självkänsla’ [On Female Self-Esteem] in May 1932. At this time, she was also a member of the Nordic Women’s Joint Committee. From 1937 to 1940, she was also secretary of the Committee for Increased Female Representation, a cross-party organization that aimed to vote more women into municipal assemblies and the Riksdag in 1938 and 1940. For the 1938 election, the committee commissioned the artist and journalist Mollie Faustman to create a poster with the words ‘Women: We Can, We Are Needed, Election Year 1938′ (no. M 1938/004 in our poster collection), and a brochure with a similar title. In parallel with this assignment, Åkerman undertook a survey of families with children living in overcrowded conditions, published in 1941 under the title ‘Familjen som växte ur sitt hem’ [The Family That Outgrew Its Home]. Objective criticism and questioning based on facts and empiricism became her trademark from now on. 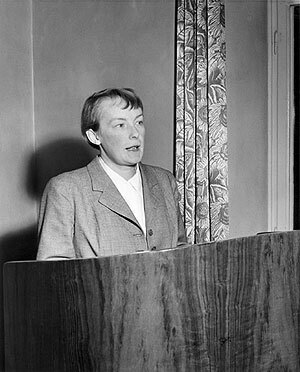 Brita Åkerman (1906-2006). Photo: Sahlstedts Bildbyrå. Source: ARAB, Morgonbris. In 1940, the economist Karin Kock, former first vice-chair of the Committee for Increased Representation of Women, was commissioned by the Swedish Government to find a director for Active Housekeeping, an information bureau within the State Information Board. She recommended Brita Åkerman, who accepted on the condition that Kaj Andersson, who, amongst other things, was the editor of Morgonbris, was included. In 1943, the bureau was moved to the National Price Control Board, where its position became somewhat obscured. Åkerman stayed until 1946, six years in total-the longest period so far in a career characterized by frequent departuresi- and, as was often the case, with several commitments at the same time. From 1941 to 1947, Åkerman was secretary of the women’s delegation within the 1941 Population Commission, and wrote the reports ‘Social hemhjälp’ [Social Home Help], ‘Den husliga utbildningen’ [Domestic Education], and ‘Familjeliv och hemarbete’ [Family Life and House Work]. The last one sparked a lively debate in 1948 between the artist Siri Derkert in the newspaper Ny dag and Brita Åkerman in Hertha no. 3-4 (reprinted in 1991 in the publication Häften för kritiska studier [Booklet for Critical Studies]). 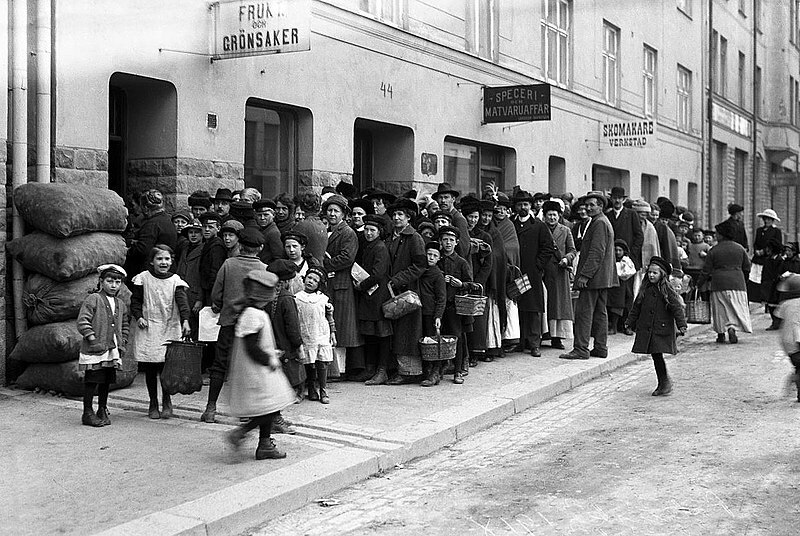 Derkert accused the delegation of confining women to an outdated notion of domestic slavery, while Åkerman believed that they sought to improve women’s conditions within the framework set by that period. During her time in the Fredrika Bremer Association, Brita had become acquainted with the writer Elin Wägner. Their contact developed after the publication in 1941 of Wägner’s book Väckarklocka [Alarm Clock], in which she was keen to enhance the value of traditional women’s tasks. Many within the women’s associations were put off by this stance, just as Siri Derkert had been. Åkerman, however, found Wägner’s views worthy of consideration, having herself concluded that women’s lives needed to be improved both at home and outside, and that this could only happen by gaining power over their own conditions. She and Wägner exchanged ideas by letter between 1940 and 1948. The tone was rather formal at the outset, but gradually became increasingly friendly (Wägner died in January 1949). The large group of experts who worked together in Active Housekeeping soon saw the need for research into household issues, which led to the idea of the Home Research Institute (Hemmens forskningsinstitut [HFI]), which was founded in 1944. Brita Åkerman was appointed an executive member of the working committee; she frequently sent funding applications to the grant-awarding authorities, and succeeded in obtaining the funds needed. The institute started its activities with studies of kitchen equipment and working conditions, and then went on to review all kinds of goods and services, publish booklets, arrange exhibitions, etc. The results of the studies received considerable attention in newspapers and led to major domestic improvements, particularly with regard to kitchen appliances and fixtures. The HFI later became the Consumer Institute (Konsumentinstitutet), and, subsequently, the Swedish Consumer Agency (Konsumentverket). But, according to Katja Waldén’s interview in Form 1/1979, Brita was not entirely satisfied with the development, because ‘the big idea, that households would have a say in production and distribution issues, has been forgotten’. In the same interview, Brita spoke condescendingly of her first choice of education, which she described as ‘the conventional girls’ subjects’. But the articles on literature she wrote in the 1920s and 1930s, in which she paid particular attention to newer female writers but rejected modernist experiments in form, indicate a deeper interest. It is worth noting, too, that her thesis analyzes reportage. She also put her studies in the romance languages and English to use, gradually corresponding in English, French, and German. 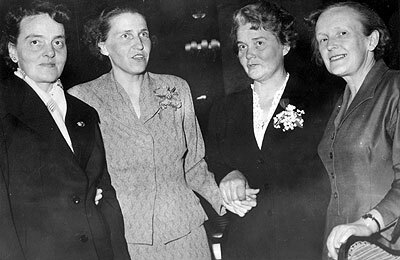 Maja Levin, Ulla Lindström, Brita Åkerman and Edith Malmberg at the Swedish Social Democratic Women’s Federation’s Congress in 1956. Photo: Sven Larsson. Source: ARAB, Morgon-Tidningen. From 1945, Brita’s time spent at the HFI was reduced, and within the Swedish Society for Industrial Design (Svenska slöjdföreningen [SSF], then the Swedish Society of Crafts and Design [Föreningen Svensk Form] from 1976), her main task was to oversee the cooperation between the unions and adult education movements. This also meant conferences held at the International Labour Office (ILO) in Geneva and correspondence with ILO and other foreign organizations. The Swedish unions, however, remained indifferent. ‘The truth is that the Swedish trade-union movement is basically not interested in the type of culture regarding the environment’, Brita said in the above-mentioned interview. At the SSF, she was involved in housing investigations and organized exhibitions of flats and household goods, etc. These activities attracted a lot of media attention, and ultimately contributed to lighter and more comfortable furniture, and homes that were easier to keep tidy. The work also included study visits from and to other countries; Brita attended home and housing exhibitions, met with sister organizations, and made occasional home visits to study housing standards-for example in Switzerland in 1948, where she was critical of the limited kitchen space in newly built flats. From 1945 to 1949, she was also a member of the Committee for Social Information, and from 1948 to 1956 a member of the Public Housing Committee, which planned for collective housing in the spirit of Alva Myrdal, and in both capacities she could benefit from her international experience. As with her reading of literature, France and Great Britain especially appear to have appealed to her. In the case of the former, above all, the annual Salon des Arts Ménagers in Paris, which she attended in 1953 and, other years, corresponded with and received documentation from. In France, she also maintained contacts with, among others, Centre de documentation de l’habitation (The Centre for Housing Documentation)-which ran similar activities to the HFI and the SSF-and the Enseignement ménager (Domestic Education Department) of the Caisse centrale d’allocations familiales de la région parisienne (Central Family Allowance Fund for the Paris Region), which she visited on Monday 19 March 1951. In the spring of 1953, the department sent a female employee on a four-month study visit to Sweden, which included visits to both Brita and her sister (see below). In Great Britain, she was in contact with the Furniture Development Council and the Council of Industrial Design, through both written correspondence and several personal visits. Åkerman left the SSF in 1951 and the HFI in 1953. After this, she had a variety of assignments within social housing and consumer policy. She was also on the editorial board of the cooperative housing organization HSB’s journal Att Bo from 1954 to 1969, and vice-chair of the Swedish Consumer Council (Konsumentrådet) from 1957 to 1962. Her international dealings continued. During a study visit to Moscow in November 1957, she inspected flats and consumer goods, as she did later in Moscow and Kiev in 1969. A trip to China in 1959 resulted in lectures and newspaper articles. Åkerman attended housing exhibitions in Zurich and Brussels in 1958, Milan in 1960, Turin in 1961, and Lausanne in 1964. In February 1962, she took part in the conference ‘La Psychologie de la Maison’ (The Psychology of the Home) in Marseille. In 1962, she returned to the SSF as assistant director, but found that the organization had changed direction and no longer focused on everyday goods, which is why, in 1967, she moved to a post as secretary of the Committee for Women’s Affairs in Stockholm Municipality (The Women’s Committee), where she stayed until 1975. In 1968, she published the polemical work ‘Makt åt konsumenten’ [Power to the Consumer], where she attacked the consumer policy being pursued, the degenerates in advertising, and the ongoing destruction of the environment. The International Organization of Consumers Unions wrote to her in 1969 for permission to publish a translation. Åkerman had long been an internationally known consumer researcher, and was often invited to courses and conferences in Sweden and abroad. Within the Committee for Women’s Affairs, she wrote Ensamstående föräldrar [Single Parents] and Program för jämställdhet mellan kvinnor och män [Gender Equality Programme] in 1970, Kvinnor i kommunens tjänst [Women Working for the Municipality] in 1972, and Service och gemenskap där vi bor i Stockholm [Service and Community Where We Live in Stockholm] in 1975. Starting in her twenties, and for almost eighty years, Åkerman was an active writer, who often published articles on women’s, housing, and consumer issues in newspapers and journals. She was also involved in a great many projects related to these subject areas. From 1980 to 1984, she led the women’s research project ‘Kvinnorna och hemarbetet’ [Women and Housework], which, in 1983-84, published the books, Den okända vardagen [The Unrecognized Workday], Vi kan, vi behövs [We Can, We are Needed], and Kunskap för vår vardag [Knowledge for Our Daily Life]. In January 1987, she went to Vietnam, amongst other things, to attend the seminar ‘Women and Science’ in Hanoi on 8-10 January. She also made home visits in rural areas and inquired into what kitchen equipment was needed in the villages, particularly the types of cookers that would be suitable. In 1994, she published her autobiography 88 år på 1900-talet [88 Years in the 1900s] and, in 1997, the biography Alva Myrdal: från storbarnkammare till fredspris [Alva Myrdal: From Large Nursery to Peace Prize], which includes an account of when she worked together with Alva Myrdal. Swedish and foreign researchers sometimes contacted her and asked her to describe her time at the Home Research Institute and the Swedish Society for Industrial Design. Brita Åkerman was a well-known person who attracted much attention, particularly during the 1940s and 1950s, and her various assignments, investigations, and proposals were frequently reported in the Swedish press, and sometimes even in other Nordic countries. The nature of her subjects allowed her to have column space in the Swedish weeklies, where she was portrayed as something of a female role model in interviews and ‘at-home-with’ features from her house in Stocksund, which often pictured her together with her husband and five children. She had been married since 1932 to the economist and housing expert Alf Johansson (1901-81). Her sister was the housing researcher Carin Boalt (1912-99), with whom she worked to some extent. The sisters’ technical/scientific perspective on consuimer research has been highly influential in Sweden, although Brita Åkerman saw herself primarily as a humanist. The extent, to which foreign countries have inspired her, is difficult to determine, even if she liked to refer to British and French traditions in the field. For her pioneering work in consumer policy and research on the everyday lives of women, she was awarded an honorary doctorate in Engineering from Chalmers University of Technology in 1979, and an honorary doctorate in Philosophy from Umeå University in 1996. The private papers of Brita Åkerman consist mainly of manuscripts, correspondence, and documents by topic. A large collection of newspaper clippings provides valuable information about her life and work. Despite the archive’s size (fifty-seven volumes taking up around four metres of shelf space), much of what Åkerman did is only sparsely covered-perhaps primarily due to the diversity of her undertakings. ← WOW! Worlds of Women!